The Newest Rant: Mike Wolfer is Running a Cool New Kickstarter! 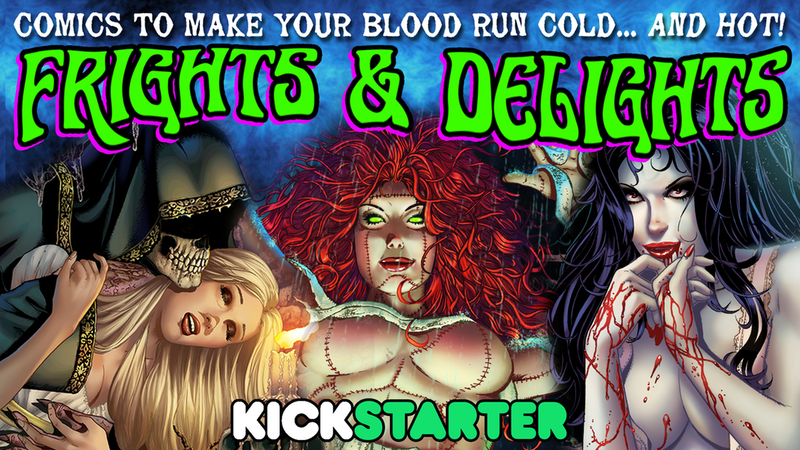 "Frights & Delights is an all-new, full-color, pin-up book in the tradition of my previous Gallery of Terror/Horror/Monsters and Maximum Widow Exhibition books. You know how comics are these days, with all of the variant covers. And all of my books have variants, too, but unless you buy them all (and who can afford that), there's no one place where you can view all of the art in one sitting. So that's why I'm doing books like Frights & Delights. It gives everyone a chance to enjoy all of those various and sometimes obscure pieces of art, finally collected together in single volumes." "That's exactly the reason. Because of all of the recent, high-profile work I've done with American Mythology Productions, like Eternal Thirst of Dracula and The Land That Time Forgot, along with a few other projects that showcase my art, I've had a lot of new readers discovering my work and saying, "Wow- I've never seen your stuff before, but you've got a new fan." So I figured that since I have a huge body of work that's available in print, and since I don't have a website or mail order business, the easiest way to not only fund a new project but to offer all of those dozens and dozens of stories and series to people just discovering me is through Kickstarter. I also have a lot of people who are my super-backers, who back nearly everything that I crowdfund, but occasionally they'll miss one here or there. But once the campaign is over, that's it- You can't get many of the items or Stretch Goals again. So for old backers and new, I'm bringing back nearly all of the super-exclusive rewards from nearly all of my previous campaigns, including Stretch Goal items which were never offered anywhere else. It's like a great, catch-up or get-to-know-my-work kind of setting!" I myself am always excited for new work from Mike Wolfer and will be backing the campaign for sure! You can find it on Kickstarter here.